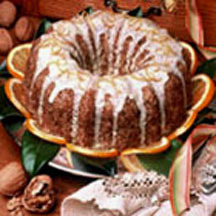 Try this delicious bundt cake topped with a yummy orange sugar glaze. Thoroughly grease a 10 to 12-cup microwave-safe bundt pan with shortening; sprinkle with 1/2 cup of the chopped walnuts to coat evenly. Sift flours, baking powder and baking soda. Cream butter and sugar until fluffy; beat in eggs, one at a time. Stir sour cream or yogurt, banana and liqueur into egg mixture. Fold flour mixture into banana-egg batter; stir in remaining walnuts. Spoon into prepared pan and place on top of microwave-proof bowl in microwave, bringing cake up to center of oven. Cook on medium 10 minutes, then on high 5 to 7 minutes until cake tests done, turning twice. Let cake stand 15 minutes. Turn out onto serving plate. Let cool. Mix sifted powdered sugar and orange juice until smooth. Pour glaze evenly over cake and serve. Makes 20 to 24 servings. Recipe and photograph provided courtesy of the Walnut Marketing Board.